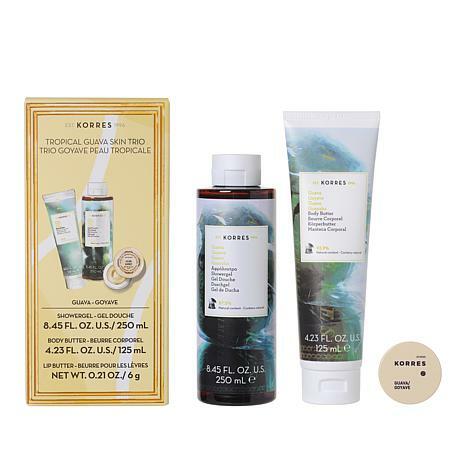 Luxuriate in an invigorating blend of tropical fruits found in this trio from Korres. 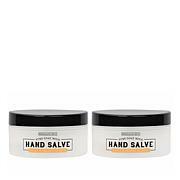 Ingredients: Aqua/Water/Eau, Sodium Laureth Sulfate, Cocamidopropyl Betaine, Sodium Cocoyl Isethionate, Coco-Glucoside, Glyceryl Oleate, Parfum/Fragrance, Aloe Barbadensis Leaf Juice, Alpha-Isomethyl Ionone, Althaea Officinalis Root Extract, Arginine, Benzyl Alcohol, Butylphenyl Methylpropional, Castoryl Maleate, Coumarin, Geraniol, Guar Hydroxypropyltrimonium Chloride, Hexyl Cinnamal, Hydrolyzed Wheat Gluten, Imidazolidinyl Urea, Lactic Acid, Limonene, Phenoxyethanol, Polyquaternium-7, Potassium Sorbate, Sodium Dehydroacetate, Sodium Gluconate, Tocopherol. PHENOXYETHANOL, POTASSIUM SORBATE, PSIDIUM GUAJAVA FRUIT EXTRACT, PYRUS CYDONIA FRUIT EXTRACT, TOCOPHEROL, VITIS VINIFERA (GRAPE) SEED EXTRACT, XANTHAN GUM. 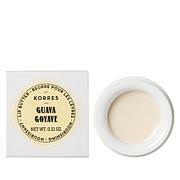 Korres Guava Lip Butter .21 oz. Ingredients: Polybutene, Trimethylolpropane Triisostearate, Hydrogenated Polydecene, Polyethylene, Hydroxystearic Acid, Stearalkonium Hectorite, Propylene Carbonate, Polyglyceryl-3 Diisostearate, Sucrose Tetrastearate Triacetate, Flavor (Aroma), Tocopherol, Dicalcium Phosphate, Carthamus Tinctorius (Safflower) Seed Oil, Ascorbyl Palmitate, Oryza Sativa (Rice) Bran Wax, Psidium Guajava Fruit Extract, Butyrospermum Parkii (Shea) Butter Extract. May Contain: Titanium Dioxide (CI 77891). 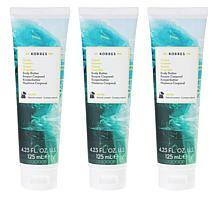 Love the products, they smell beachy and hydrate the lips and body well. 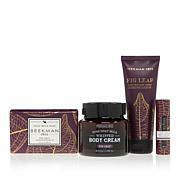 I love the subtle scent in this skin trio and how moisturized my skin feels after use. The lip balm is incredible! It has done wonders for my dry, chapped lips. 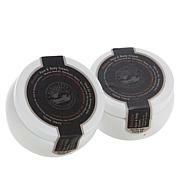 Makes your skin super silky smooth with a tropical scent that is just refreshing! 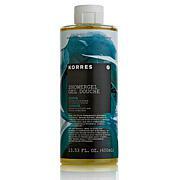 Korres knocked this one out of the park. Love this fragrance and trio ser! I gave a few Guava sets for Christmas presents. Guava is my favorite fragrance . I'm so glad I ordered extra so I could make sure I got one. I was so happy to get his set and so we're my secret Santa recipients. 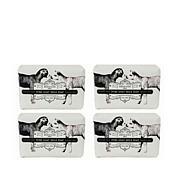 Love the lip balm. Please bring this set back soon. 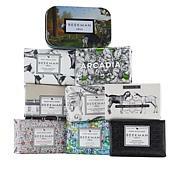 How about the coconut guave fragrance as a kit too please.